by Sophia Nicolov and Andy Flack, University of Bristol for the Animal History Museum. People are always looking to create amusing photos and videos of their animals. We want to feel that our dog is the top dog, cutest dog, handsomest dog, or even the weirdest dog because we believe they deserve to be recognized as unique individuals with personalities and lives of their own. We live in an age dominated by ever-evolving technology where we are constantly trying to capture every single moment of our lives, and technology is increasingly allowing us to find new ways of looking at things, making the ordinary extraordinary. The Animal History Museum's exhibition "I'm Ready for my Close-up Mr Casteel: The Making of Underwater Dogs" does exactly this by combining a deep appreciation of the human-animal bond with the technology that creates and captures ‘never before memorialized moments' of that bond. It is for these reasons that Seth Casteel's photographs are so captivating. 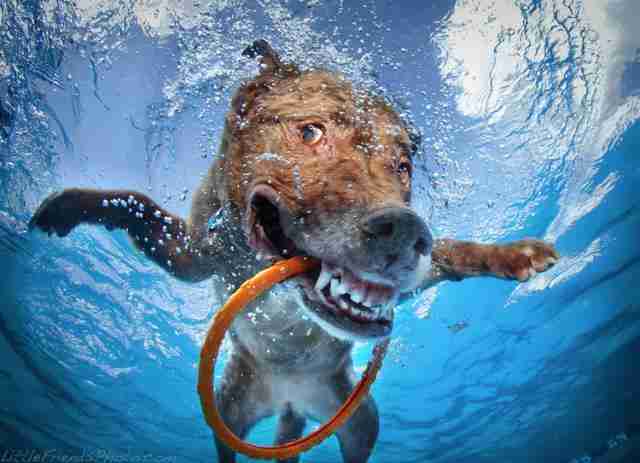 What could be more ordinary than a dog chasing a ball into the water but "the surprise, the concentration, the sheer joy of play and total engagement in a watery environment – or the remarkable mastery of technique needed to create such evocative and vibrant scenes, it seemed audiences couldn't get enough of these images," as Casteel describes it. The dogs appear to have smiling faces; they look both scary and silly, and we can recognize a range of human emotions in the faces and expressions of these creatures. Some of the dogs even appear to be laughing. Dogs are in many ways subject to the whims of our imaginations and we are forever trying to ascribe emotions to the different faces we think our companion animals "pull." This is all about understanding their personalities and their interpretation of the world around them. There is a profound desire to recognize human emotions and facial expressions in a species that we live side by side with despite being so visibly different from. The immense skill of Casteel in capturing the distorted image of the dogs makes these photographs even more entertaining: tiny paws, massive heads, "grinning," one eye closed. To some extent the dogs have morphed into something totally different, something of the dogginess has departed. One of the main points that Casteel returns to during his interview with the Animal History Museum is that he only takes photographs of dogs who genuinely love the water. He reiterates that none of the dogs were forced under water and the animals who made the final cut are those who really wanted to do it, meaning that his work is a collection of authentic moments of doggy joy. Perceiving genuine happiness in an animal, particularly when we have had a part in creating it, brings people enormous pleasure. 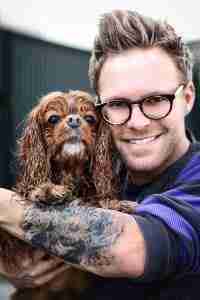 Seth Casteel shares a deep bond with dogs. Starting out as a volunteer at an animal shelter he then began using his skills as a photographer to capture the dogs' characteristics in an effort to shelter them. Through his work he came to a real understanding of canine character and this is reflected in his photographs. Casteel went on to become a lifestyle companion animal photographer and it was during a photo shoot with the King Charles spaniel named Buster that he arrived at the idea of taking photographs underwater. To the despair of the owner, the spaniel decided that he would much rather be in the water, and so Casteel got in the water with him to see what kind of images he could capture. To his surprise, following canine instinct was the best thing he could have done. Casteel now has a tattoo of Buster as a thank you to the dog who inspired a new vision for his photography. These images quickly became a viral phenomenon. People loved seeing dogs in a way that they had never seen them before. When the photos were first publicized in 2012, his Facebook page for the photos, "Little Friends," quickly went from thousands to millions of hits a day. Today, over 150 million people around the world have seen the collection of photographs. What makes Casteel even more impressive is his understanding that his work has a practical side to it. In a place like California where many homes have their own pools, he believes in the importance of teaching dogs to not only enjoy the water but to do so safely. 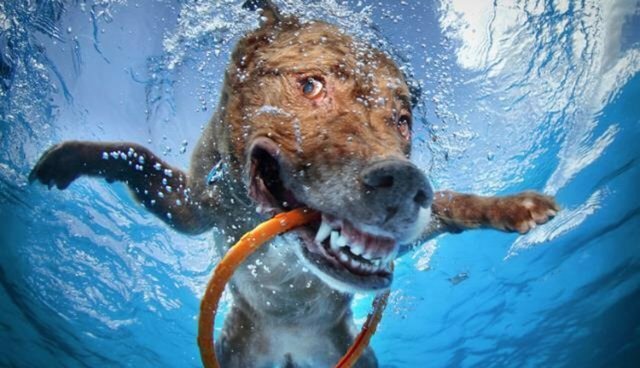 Even though "Underwater Dogs" is a collection of over 80 photographs, Casteel has made each photo fascinating in its own right because each dog is presented as a unique character. There are a number of dogs that stand out from the pack, including Rocco, the Boston terrier, with his bubble-eyed expression of surprise, and the Chesapeake Bay retriever, Dagmar, with his gap-toothed grin. The individuality of the dogs captured in these photographs is compelling, captivating the viewer with the opportunity to engage with what we believe to be different emotions on the animals' faces. Casteel reveals a rarely-glimpsed vision of man's best friend. Roger Caras, wildlife photographer, writer and president of the ASPCA, once said that "dogs are not our whole life, but they make our lives whole." Casteel's photographs illustrate this sentiment perfectly. He has memorialized an extended moment of animal happiness, a form of happiness that brings great satisfaction to us as humans and adds power to the ties that bind us to our canine companions. To view the "I'm Ready for my Close-up Mr Casteel: The Making of Underwater Dogs" exhibition at the Animal History Museum, click here.